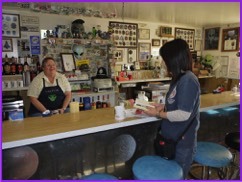 friendly environment, and our awesome staff is here to serve. 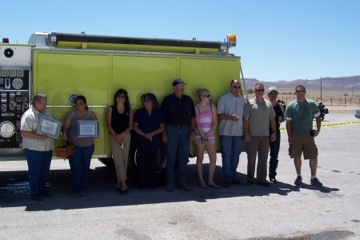 Rachel receives a donated firetruck thanks to Ceres, California. "a gift made in memory of Officer Stevenson to a community that he loved to visit and a community that has honored him with a memorial monument." Approved by their local city counsel resolution 2008-58. 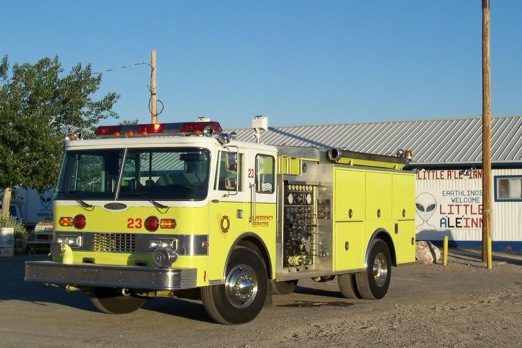 The Ceres team readies the fire engine to make the trip to Rachel, Nevada. After they finish with making it immaculately clean the team is ready to honor the fallen member of their community. This event is lead with pride and remembrance. It is a sad day; but, a great day to be a part of this adventure. Fallen members are always remembered, not forgotten, and always honored by the great community of Ceres. We in Rachel thank you for such a magnificent gesture and donation to help preserve the lives of the folks in our community. We salute your efforts and generosity. Thank you sincerely. The military will be kicking off the first of four such events. Great fun and enjoyment is seeing these flying aircraft performing tactical maneuvers. Low flying, high speeds, and taking great photos as these aircraft come scream over your head. Event runs for 2 weeks and these Red Flags are a huge part of Rachel that brings folks from all over the world to see. 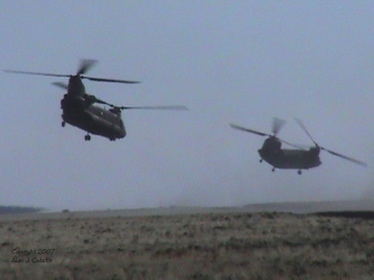 Second of four scheduled exercises. This is a special evening here at the Little A'Le'Inn. We encourage you to bring your sweetheart, friend, neighbor, or even the alien down the street to join us for this special day. We will only be serving from the special menu during these dinners. You will receive this wonderful meal and great memories for the special price of only $15.99 per person. 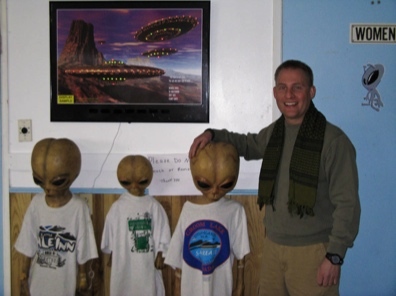 Get that someone special a 2008 UFO Friendship Campout single day or complete package deal. Save 10% on the price if you order between now and March 31, 2008. 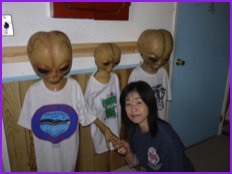 You will really make it a special day for that UFO lover in your home! • To be announced We are anticipating a good attendance, so it is a good idea to register early. Ike Bishop (world renown speaker) said, "People are encouraged to bring their Travel Trailers, Motor homes or tents for a memorable camp out experience. Flyers and agenda will be published soon. See you there."
. It's like the Hod Rod Power Tour without the testosterone!
. •It's like the 'Great Race' without the great expense!
. •Approximately 75 cars and 150 people will be joining us for their lunch stop.
.	•Enjoyment for those who love touring Nevada in their classic’s.
.	•Come take some great photos of some classic cars.
.	•At times this event sports big named celebrities touring about in their classic.
.	•More information on this charity event. The third scheduled event of the year. Fourth scheduled exercise for the year. Our thoughts: The party saw folks dancing the night away as plenty of folks also got kisses to bring in the new year. We hope everyone enjoys the 2009 year and keeps safe so we can do it again. For more information on these events see Flying Operations. These events are a great time to come out to Rachel and get some great photos of various military aircraft that participate in these events. 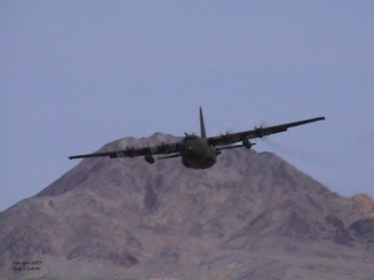 Sometimes these aircraft fly so low to the ground you would swear they are going to run you down. These events put on a great air show as they maneuver through the skies and the terrain. For lots more information about these exercises please see the wikipedia. Our thoughts on this Red Flag: We saw lots of activity and high interest from around the area. The magnitude of interest was more than typical. We are not certain why this was, however, it was to be a great time for those who came out to watch the skies and events take place. Hope to see you at the next Red Flag. Our Input: As the weather has been somewhat intense with snow, rain, and wind, we can certainly understand how this would really put a dampening on some folks not wanting to come and enjoy the great dinner served for Valentines. To our amazement we had several folks make the time and effort to come and partake of our annual dinner and it was most enjoyable. We want to thank all who came and hope to see you again real soon. Take care and stay in touch, and this goes for those who came from overseas to spend this day with us! For more information on these events see Flying Operations. See the wikipedia. Our input: It seems these Red Flags just keep getting better all the time. Each seems to be more active and intense that the previous exercise. The Knuckleheads Riding Club will be arriving about 11 AM with lots of Harley's to enjoy. Make your way out and get some great shots. You guys were so wonderful and accommodating to us on Sunday. Everyone commented on how good the food was and surprised at how reasonable you charged! We especially liked the Jack and Cokes!!! The name of our club is The Knuckleheads Riding Club – Knucklehead is the name of an early Harley Davidson and it seems to be appropriate for the majority of our members! We are also members of an on-line motorcycle web site called BikerOrNot.com and it is through this site we coordinated with the non members. Again, let me pass on all of the riders grateful thanks for taking such good care of us and don’t be surprised if another ‘invasion’ takes place later in the summer! Our Input: What a great group to be a part of if you want to join or are looking for a motorcycle club to be associated with. These folks were so very pleasurable and funny. We have extended them a return invitation any time they want to come back. If was truly our pleasure to serve them. They had lots of great bikes. Our joyous inputs:	Wow! We had a great showing for these events. Several folks stayed to enjoy both the dinner and the party. Seems that maybe several had a great time and may be a little green the next day or two. Thank you to all who came and we do hope that everyone did indeed see aliens and their spacecrafts as the good times were manifesting themselves all over the place. Darn the Irish! They always seem to know how to throw a great party. Our menu will be Ham and Trimmings for $9.99 per person. Make sure to come and join us on this very special day. We want to thank all who stopped by and enjoyed this special day with us. We appreciate your continued support and look forward to doing this again next year. Great group of fun people! We had a blast. It seems almost everyone wanted for it to last much longer. 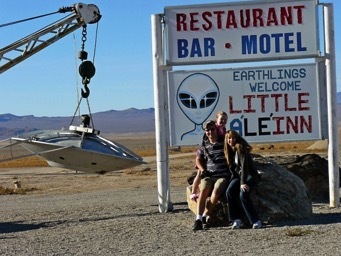 This place, Area 51 (and Rachel), just tends to grow on you. A little windy, beautiful day for what was a nice turnout, and a beautiful day for a festival. Spring season this year has been all to great to put into words. We do hope everyone enjoyed the parade and hope to see you again next year. Thanks for coming. The dinner left one feeling the reverence within the room. Mother's, important to us all, are so much to each and every one, we can only say enjoy them while they are with us, because after they have passed, it hurts so much to not see them on their special day. They are always with us, and shall always be remembered. Mother I Love You. 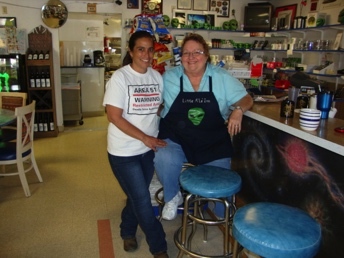 A paranormal group from Las Vegas will be coming to Rachel and the Little A'Le'Inn the weekend of Memorial Day 2009. The dates are to be May 23 & 24, starting at 10 AM, and going until whenever. The group will be presenting reports and findings on the paranormal activities in and around the area. This will be an open mic event for all to share their own experiences and encounters. Bring any and all the people you want as this gathering will be both enlightening and fare worthy. 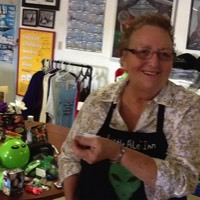 ☞ Set up & sell any goods ufo related or not -- you decide! ☞ BBQ dinners will be available both nights should you want to join in. Prices are discounted if bought before May 10, 2009 PST. Our Thoughts on this weekend event: Approximately 40 people came out to enjoy the weekend event. Gale force winds prevented us from having our BBQ, but we all adjusted quite nicely to the food inside away from the wind and rain! A special thanks to John & Betsy Kolb for their Astronomy presentation; it was thoroughly enjoyed by all in attendance and the Astronomy CD's were a great surprise bonus gift! Everyone also enjoyed "guy & his '51 Chevy" who came out and talked to everyone! Join us on this day and every Father gets a FREE gift. See you there and remember Father needs to be present to get his free gift. Thoughts for the day: It was a beautiful day and time for those who came to us to spend the special time with their loved Father's. Our input: We had great weather, great company, and super presentations for all the folks who came out. Thank you all so much for spending your holiday with us here in Rachel. We certainly enjoyed it all, and felt very honored you choose to be here on our country's freedom birthday. -- Update: 700-800 folks are here for this race today. -- Come join us and have fun! All Day Long! 24 Hours!! Billed as thee marathon to enter ! This will be the third year for this event. We fully support this event by being open 24 hours a day and supplying breakfast after the end of the race. Be sure to sign up for this event and get your reservations in quickly as there were almost 400 people in the races. Our input: WOW what a turnout this was for a great event. Well managed, weather was great, the folks were awesome, and the event went off without a hitch. This was the 3rd time for this marathon and it just keeps getting bigger and better. They have already scheduled the next one for August 21, 2010. See you there we hope as so many people and with so little time when you consider about 800 attended. The astronomy program will be presented Sunday night at 7:30 PM. A free cd will be provided with the PowerPoint presentation and related data. This includes a PDF file on viewing the moon from Astronomy Magazine. Wizard Nebulas, Star Warps and Star Hoppers and other glass wonders will be available Saturday, Sunday and Monday afternoons, depending on weather and availability. Brought to you by "The Wizard and The Lady of The Red Desert"
Great time was had. We witnessed some pretty crazy costumes and lots of fun. Seems that lots of folks came to have a great time and they did. -- FREE DINNER --- Just bring a side dish. Anyhow, keep us posted on the events coming next Spring. I was reading about the event you host in town where guest speakers talk on various related subjects amidst a friendly gathering of enthusiasts and it sounds like a great time for everyone. I only wish I could bring my four-wheelers out to your neck of the woods. It would make for an amazing experience for sure! Anyhow, thanks again for your hospitality and we wish you, and your family and friends a wonderful, healthy and prosperous holiday season! Thank you for this most wonderful email. We so appreciate this response. Now you understand why we have this event every year. This brings more meaning than one could ever know. We will be closing at noon. Merry Christmas to all. Enjoy the time and take the time to spend it with those you love and share with as many as you can. We will be closed all day. Merry Christmas to all! Be safe and may all your holidays be happy ones. Party favors, hats, and munchies - be there for 2010 to begin. Let us say there was some real noise makers around the time of midnight that the winds carried to the heavenly bound aliens. Hope we did not disturb them too much. It was fun and great laughs. See you next year and thanks for joining us. Be safe and have a great year. Again this year we have had a very busy and active sky. The Red Flag exercises bring together some of the best aerial shows you will ever see. From the high up tactical maneuvers, to the low soaring earth shattering, hair raising near miss 100ft overhead speed passes. They can just put you in awe. We hope everyone that came out to see this first exercise got a little something to remember it by. 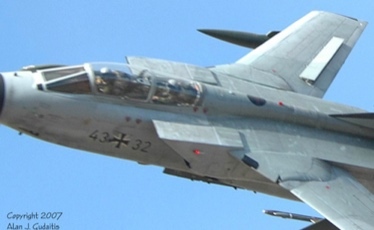 It can be pretty scary when those jets soar so low to the ground and just above your head. Wow ! We had a great turnout for this year's Super Bowl game. Some folks loved the outcome; yet, others despised the final score. We of course remained neutral as you can imagine for several reasons. Some folks really take their football very serious... all in fun we say. Anyway thank you for spending a great day with us here at the inn. We enjoyed having you. Some of the best times of the year are during those special holidays when we get to show off our feelings for those we love. This year's gathering for Valentines Day was one of those times. Our servers, bartenders, and cooks all dressed in very sharp stylish clothing with dress shirts, ties, and sport coats. We had folks who went all out in their manner of dress, displayed such love and tenderness to their life partners, and laughed so much they cried ... of course in each other's arms. We want to thank all who came out to see us on this day. You made this one of our best Valentines ever. The number of folks who enjoyed the meal with us was the highest we have ever had. From the flower arrangements and valentines cards to the prime rib and cornish games hens the day was a huge success. Again the exercise did not disappoint. The tremendous display of fast moving, low flying, super thrusting machines attacked the skies with a fury and vengeance. 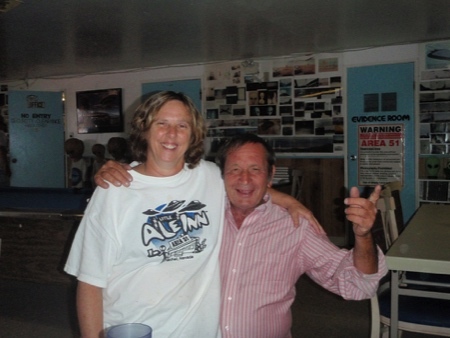 We had several guests come and spend the days and evenings so as to see all the excitement. It is still those low flying, super heart throbbing, sonic boom busting, over-head bullets of an aircraft rushing by that gives most folks just what they came to see - a thrill of a lifetime! Make certain to come out and catch the next one coming in July. Weather was not kind for the ride so this event was postponed. We saw green for days after this party and gathering. Lots of fun for all. The tables had green flowers and the one person showed up wearing 10 different shades of green and won an Alien Head GREEN cookie jar. The corned beef and cabbage dinner was well liked by all. The sponsored event did not have enough riders sign up so for this year the event was cancelled. Our honored guest was the long time resident and pillar of our community Fay Day. She started the parade off in the lead car. We had over 50 motorcycles riders, Rachel Fire Engine, DRI Sheriff's car, ATV's, and of course the Little A'Le'Inn famous truck joining in the long line of vehicles. Lots of fun was to be had. The pot luck BBQ afterwards was a huge success as folks ate tons of food, laughed, and had some great times with each other. Pictures below. 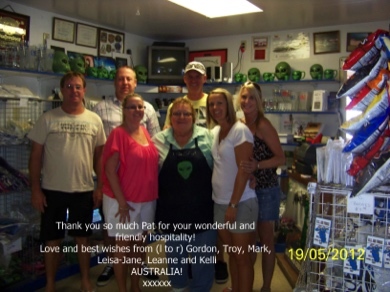 The day was enjoyed by several "MOMS" and each was presented with a green alien bell! They could ring the bell to their hearts delight so all their loved ones could jump right up and provide them with whatever service they may have needed or wanted. It was great to see and lots of fun. Pat was presented with 4 beautiful rose bushes (pink, orange, white, and purple) that are planted out front of her place for all to enjoy. Pictures to follow shortly. We had a great visit from a Harley club and some super shots that were provided not only from the bar, but, photos from K Langley as well. Just a note of interest - we understand the BBQ went over really well and folks ate a bunch of food, however; some say the cook this year really out did himself. Should have been there as the say it was most excellently prepared. Wow what a great bunch of folks who passed through our doors for most of this week and into the next. Seemed these people really love exploring the outdoors and finding those geo caches that have been left behind. The way this all works is pretty simple and most folks can get involved for a very low cost. You just need to get a cheap GPS device and decide where you want to go by using their website. More info can be found in these details. 1000 alien landings and a geocache at each landing sight! Get your special coins and join in on the fun. With all the Geocacher's in the area we had a busy day serving father's their highly deserved steak dinners. Lots of laughter and a great amount of talk about all the alien treasures found. This included the specially marked coins. BBQ & Water Fight - Run for your life. As folks brought out some wicked water toys to show these young kids that they have nothing on the older generation when it comes to a good old fashion water fight. We heard said that you may be able to out run us, but; never out gun us!! Adults: 1 Kids : 0. The same score when it came to the BBQ as the food was most excellent. Maybe next year the kids will be a little wiser and more on the ball when they get splattered, dowsed and roasted. The food was much needed after all the activity going on during the water duels. 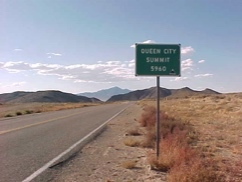 With hundreds of runners and observers ascending upon Area 51 and Rachel you could tell that something really special was going on or about to do so. This year's race brought more people and more runners than ever before. There was excitement in the air as if a new alien life form was about to descend upon us. 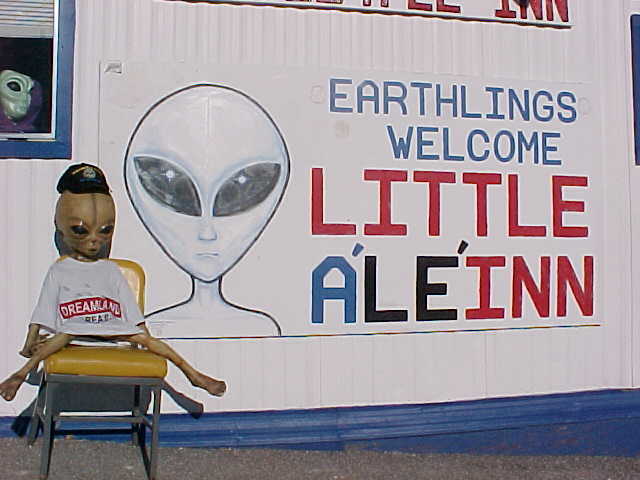 And yes this is just what happened as all sorts of clothing styles and aliens from near and afar made their way through the beautiful night sky and down the ET Highway 375 to finish a race at the Little A'Le'Inn. This race has been deemed to be thee race to attend of all marathon races. Make certain to come out and join us again next year. Thank you for all who came and participated as it was truly a unique experience that everyone should take part of at least once; especially if you are a long distance runner. The day was a huge success. We saw lots of folks that we had seen from previous years and in addition; we got to meet many new folks who brought lots of great side dishes for everyone to enjoy. Judging from the amount of food consumed we would say nobody went home hungry. We truly love this day as it is our way of giving back to so many folks. We may never have met before, maybe you have never had a Thanksgiving with anyone in the United States and this was your first. 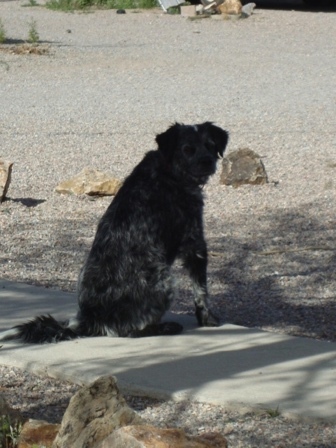 Whatever brought you to our doorstep, we are glad you came and thanks. 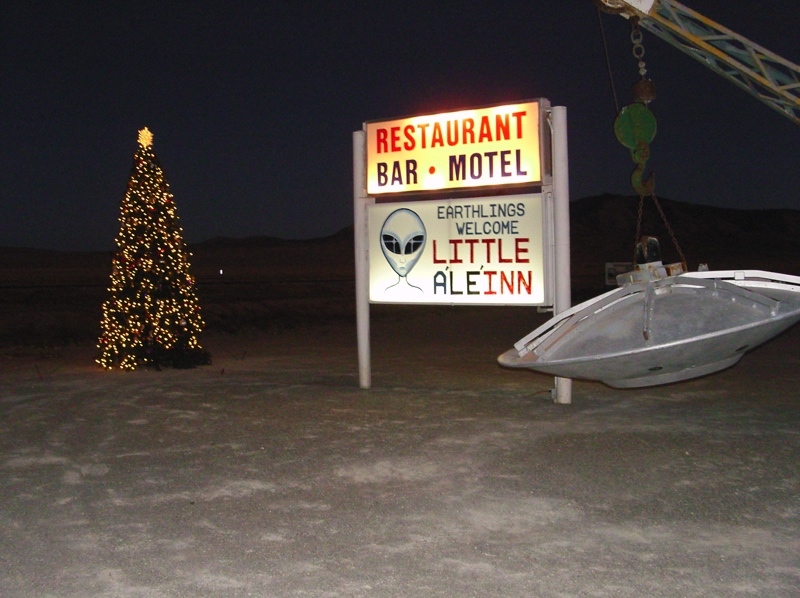 The holiday season is a special time of year for us all here at the Little A'Le'Inn. It's a time to remember all the new friends and acquaintances we have made through the years. We wish you all a very special season and thank you for taking your time to come and see us here in Rachel. For those who passed on this year it is our greatest hope that your families come together and join in celebrating the season, and remain in close contact, as we lost several of our residents and friends this past year. Give thanks where you can and often as you never know what tomorrow may bring. May each and every one of you, old and new friends alike, rejoice and feel the heart felt love that we express. May the season bring great blessings and meaning to each persons life as it has in ours. Merry Christmas. Free party favors and Hors d’oeuvres. Out with the old and in with the new year. Thanks for spending the time with us here and we hope, and wish, you all the best in 2011. 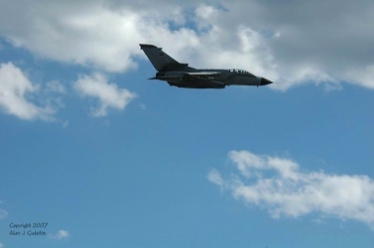 Again the skies will be filled with low level thunderous earth shattering booms as the various aircraft come together in another joint exercise. 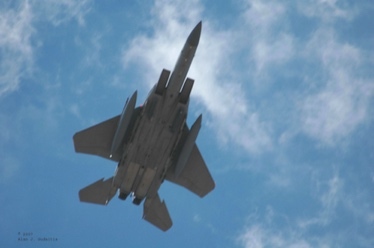 This year should be another great one for getting up close and personal with your favorite military jets. Their low level passes and aerial movements should bring joy and amazement to all who come out to watch. We will be having free chili dogs and nachos during the game until they are gone. Come on out and enjoy the game and free food! We will be having our annual dinner featuring Prime Rib or Cornish Game Hen, soup or salad, choice of potato, our Special Strawberry Shortcake for dessert. drinks include Champagne or Wine or Soda, and the cost is $16.99 per person. We will start dinner at 1pm. with a grill open for all different meats to be donated. All proceeds will go to the rachel day fund. This day is very casual and food will be until it runs out!!!! BBQ / potluck the cost will be $7.00 for adults, $4.00 for children 5 to 12, age under 5 free. No one is required to bring a dish, however; it is always is fun to see the different side dishes that have been brought to the table . The inn will furnish all the hamburgers, hot dogs, baked beans, coleslaw and the trimmings for the meats. We start collecting checks, cash or toys until Monday the 5th of December. Checks should be made out to the Little A'Le'Inn and marked for toys. On December 17th the gifts will be given out by Alyssa Lee, Lola Sharp and myself (Pat). We will purchase toys as we get $500.00 at a time. We would like to see $5000 collected for this very worthy cause. More information about the event. Rooms fill up fast so make reservations soon. The marathon breakfast will have scrambles eggs, link sausage, biscuits with gravy, fruit, bagels, cream cheese, jelly and it will be served at 2 AM until 7 AM. Brought to you by GeoCaching page of: Clay4 & whtwolfden! 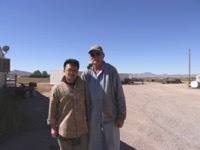 The Area 51 Roadrunners, the men who flew the U-2 and A-12 Spy Planes out of Area 51, return to Rachel, NV, just outside the gates of Area 51. Please help us welcome the heroes of the cold war at the Little A'Le'Inn in Rachel around noon on Wednesday, October 5. Some of the Roadrunners, including former A-12 pilot Frank Murray and Aviation Historian Peter Merlin will be available for questions and autographs. 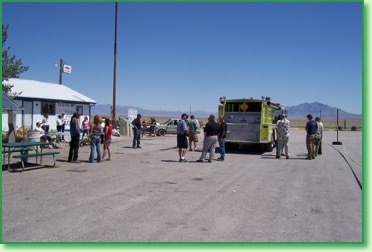 There will be some exhibits related to the history of Area 51 and a brand new 2011 satellite image of the base. We also expect to have some of the items from the official CIA store available for sale during the event, including commemorative coins, hats and much more. This will be the first time these rare collectors items are available to the general public. Costume contest with prizes for Male & Female. Free snack foods. FREE to all - Ham, Turkey and Dressing, Yams, Mashed Potatoes and Gravy, Green Peas and Carrots, Deviled Eggs, Macaroni Salad, Fruit Salad, Garlic Biscuits, Cranberry Sauce, Fresh Cranberry Relish, Pumpkin Pie, Mincemeat Pie, Cheese Cake with Cherries. Free cover - no charge party favors so come on out do some dancing and bring in the new year with us and the aliens. This is a very special car group! You have got to see the beauties that will pour into our parking lot for this event. 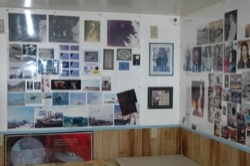 Here is a taste of what you can see in person if you come on out. To know more about this event please visit this website. BBQ chicken, hot dogs, mac & cheese, baked beans, corn on the cob, chef;s choice, watermelon and cake. Dates and units participating in Red Flag exercises are subject to change. We are so grateful to you for all you do!! Thanks. Potluck Dinner from 2pm to 6pm - Please bring a side dish to share with others. 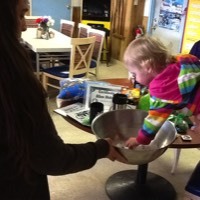 This has been our long standing tradition to give back to others for all they have given to us. world come and spend their very first Thanksgiving with us. Please come out anytime and join us! We welcome you and your family to some great food, friendly environment, and our awesome staff is here to serve. Place an online order during the the month of February. filled with Little A'Le'Inn merchandise. The more times you order, the greater the chances you have of winning. Winner will be selected on March 4, 2013. We will ship the Easter basket directly to you at no cost. Good luck and here is hopping you are the lucky winner. Please note that we may need to get an address from you as not all online purchases give us that information. lots of FREE munchies and a drawing for a free door prize. The Red Flag exercises bring together some of the best aerial shows you will ever see. Photographers be ready as you may see high altitude tactical maneuvers, low soaring earth shattering high speed passes about 100 feet over your head. We hope everyone who comes out to enjoy these has a story to tell and maybe we can get it posted here. 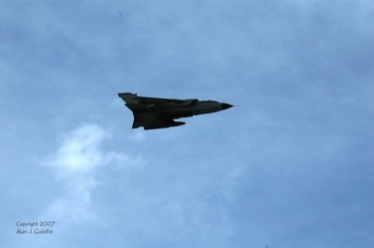 It can be pretty scary when those jets soar so low to the ground and just above your head! Please be advised hearing protection should be considered. $9.99 Plus tax Corned beef and cabbage a great green dessert a drawing for a green door prize Wear your green!!!!! 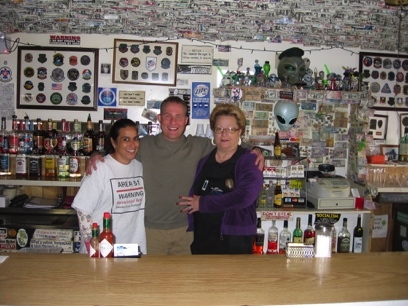 a free Alien burger to all active and retired military with I.D. A great time for all to see. 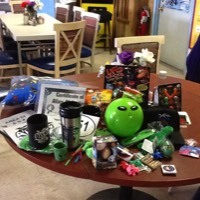 * Door Prize each day Green Alien Bank at 8pm. Please come on out and have a great time with us all. This event supports a great cause too. Let's all have some fun together. The Red Flag exercises bring together some of the best aerial shows you will ever see. Photographers be ready as many of these events happen in a super fast, split second moment. ends when when you are asleep !!!! !